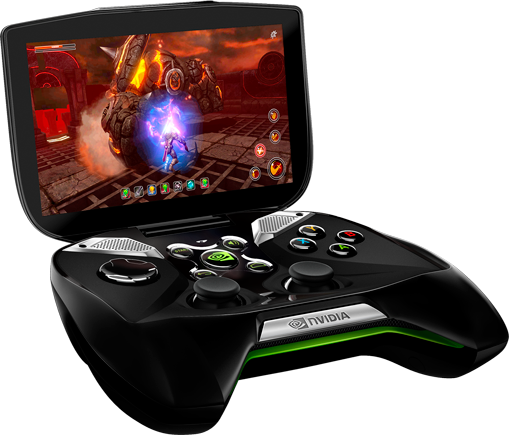 Nvidia has announced that in quarter 2 of 2013 they will release an innovative new kind of handheld gaming system that they now call Project Shield that will for sure revolutionize this genre of gaming console. It consists of a five inch Android tablet connected to an Xbox style controller. The tablet sports a Tegra 4 processor which Nvidia also recently unveiled and called the ‘world’s fastest mobile processor’. Tegra 4 is powerful enough to display 4K resolutions to external displays over HDMI. The handheld is able to play console-quality games while still staying mobile enough to bring with you everywhere you go in a backpack or purse. Another big point that they made pertains to the sound quality. As stated, the quality ‘rivals Beats Audio equipped laptops.’ The handheld comes equipped with a 33Wh battery lasting up to ten hours of playtime or 24 hours of HD video playback. If those numbers hold true, that is excellent battery life out of a handheld that displays 720p on a Retinal display with 294 pixels per inch. This monster also comes sporting a convenient micro-SD slot and a barebones, skinless Android operating system with the essential Google apps such as Gmail and the Play Store. The thing is, I haven’t even stated the BEST feature. In addition to being able to play all games available to Android devices and the games in the Tegra Zone, you can stream games from your PC over Wi-Fi! This is only available to those with PCs sporting a GeForce GTX 650 or higher, but considering the affordable prices as of late on these cards it shouldn’t be too hard if you look to upgrade. Owners can tether the device to their Steam account and stream games to their handheld anywhere in their home. So if you bought a Wii U in hopes of being able to use it on the toilet but found out that the toilet is just two feet too far away, here’s your new product! Nvidia also says that it will support wireless streaming to display devices in the future. This means playing a console or PC game on a big screen with a console attached to your controller! Hopefully more awesome news comes out about this handheld in the future as well. There is no price point set for the console, so we could only speculate. It is scheduled to release to the US and Canada in the second quarter of this year. See the video below for a more in depth preview of the product.